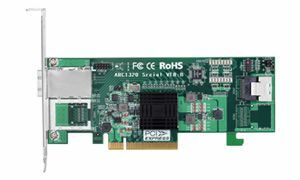 SAS 2.0 Non-RAID Host Adapter, PCIe 2.0 x8 interface, internal connection via 1 x SFF-8087, external connection via 1 x SFF-8088. 6G performance. Drivers for all major OSs.